A rendering of the proposed pedestrian connector between the former Gazette building, left, on East William Street and Delaware City Hall, right. Discussions surrounding the renovation of the former Delaware Gazette building on East William Street continued on Wednesday night at the meeting of the Delaware Historical Preservation Commission (HPC). 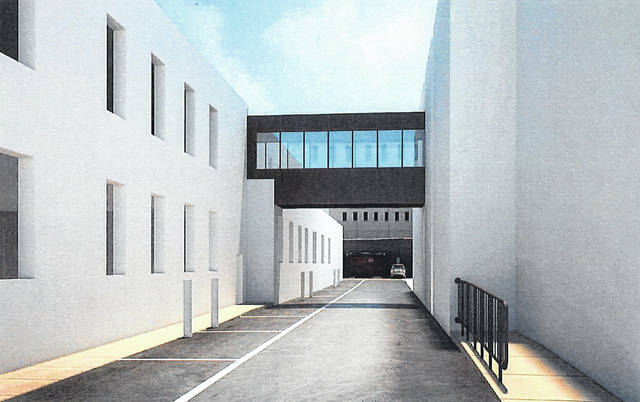 In particular, renderings of the proposed sky bridge that would connect City Hall with the second floor of the Gazette building, which the city will use for additional office space, were presented and discussed. The sky bridge connecting the city offices would allow for separation between the COhatch offices and the city’s use of the second floor. In discussing the proposed design of the pedestrian connector, Efland said the key was to include as much glass as possible so that it will “essentially disappear.” In addition to the glass, the bridge will sit back 107 feet from William Street, further reducing its visible presence. The bridge won’t be visible at all from Sandusky Street. Entrance to entrance, the walkway is expected to be approximately 45 feet long and will have a 14-foot clearance from the bottom of the connector to the driveway below. Black metal siding has been chosen by the city to cover the connector, primarily due to black being the color COhatch has proposed for the windows being renovated in the Gazette building. Metal was chosen over hardi-plank siding and thin-set brick because it is more cost effective. Hatten went on to say that without any type of guideline or standards to go by, the city is asking the commission to look at the project subjectively, which he noted is not supposed to be the case. However, he added his subjective opinions, telling Efland he thought the design seemed like a first effort and could be much better. Commissioner Joe Coleman stated he thought the current renderings looked like they “belonged on a 1980s campus,” and he added the proposed sky bridge didn’t reflect the surrounding architecture. Other details of the proposed renovations to the Gazette building included a sketch of a steel and cedar pergola covering a patio at the front entrance, as well as the type of windows that will be used to replace the 44 existing windows in the building. Matt Davis, the co-founder of COhatch, was seeking approval of carbon fiber-clad windows, which he said would save approximately $15,000 in taxpayer dollars, rather than the more expensive aluminum. Davis argued the difference in looks between the two weren’t noticeable and carbon fiber would function equally as well. However, Hatten, citing the standards HPC operates from, refused to amend those standards for this particular project, although the HPC did agree to discuss the possibility of changing that standard in the future. Barring any setbacks, COhatch is planning to open the building this fall.